I want you to know that I’ve heard your concerns about the profession and will continue to work, in every way I am able, to create an environment that allows you to teach and your students to learn. 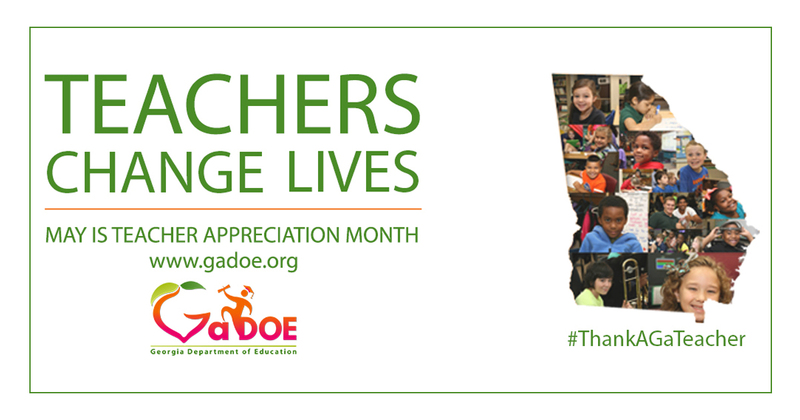 As my thoughts turned toward Teacher Appreciation Month 2016 -- which we'll celebrate throughout the month of May here in Georgia -- specific names and faces kept coming to mind. I thought of Mrs. Phillips, my third grade teacher, who wrote a letter to encourage me when I moved away, and Mrs. Michaels, my fifth grade teacher, who drove me home from school every day. I remembered my art teacher, Mr. Hudson, and Mrs. Linda Roberts – the math teacher who worked across from me when I first became a teacher, and provided a wonderful example in my early years as an educator. I thought of the teachers who’ve shaped my life, and then I thought of the many teachers I’ve met here in Georgia – who are deeply committed to doing their jobs well. Their work is not easy. The circumstances are not perfect. But they are focused, first and foremost, on their students. I also want to thank our legislators – particularly Senator Lindsey Tippins – for passing Senate Bill 364. I believe their actions speak loud and clear, and show that they appreciate all that our teachers do, because they recognize the burden of too many state-mandated tests and the over-emphasis of these tests on teachers’ evaluations. They took action to allow our teachers to be creative and teach again rather than focus on just a test. Senate Bill 364 would remove many of the barriers that have caused more of our teachers to leave the profession and fewer young people to choose teaching as a profession. The legislature overwhelmingly demonstrated to teachers that they do recognize the difficult job you have and the time and energy spent on testing and evaluations. While I know this one piece of legislation will not take away all the challenges you face, I believe it is a big step in the right direction. To all teachers: I want you to know how much you are appreciated, and how essential your contribution is. Students cannot receive an excellent education without you – you are truly educating Georgia’s future, each and every day. I want you to know that I’ve heard your concerns about the profession and will continue to work, in every way I am able, to create an environment that allows you to teach and your students to learn. • Graphics to share on social media here, here, here, and here. 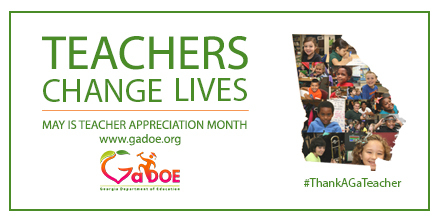 I also encourage you to share stories of great teachers using the hashtag #thankaGAteacher. 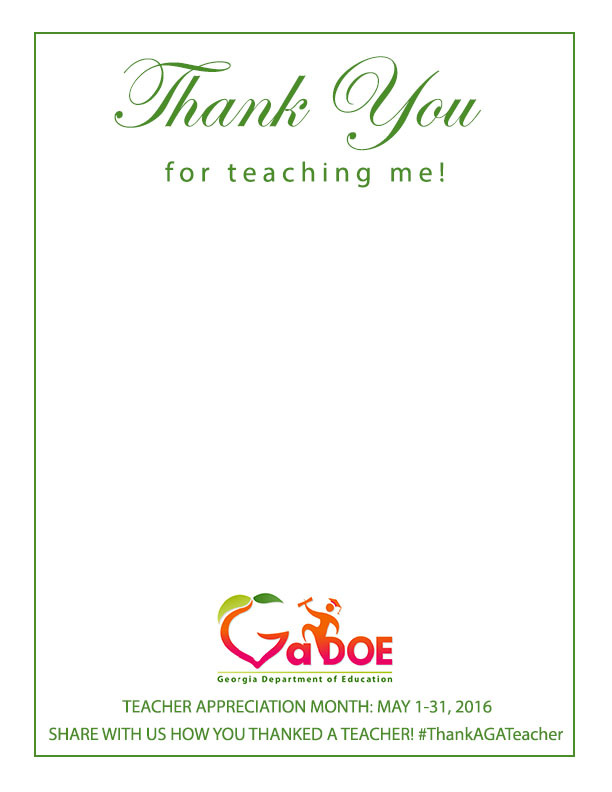 Again, I want to express my sincere gratitude to each and every one of Georgia’s teachers. Please don’t ever doubt that your work makes a difference. You are changing the lives of Georgia’s students, every single day.